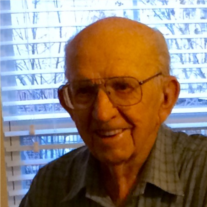 Kenneth L. Monroe, 93, Olathe, Kansas, formerly of Prairie Village, passed away Feb. 19th, 2016. Visitation will be 6-8:00pm Monday February 22nd at the Johnson County Funeral Chapel, 11200 Metcalf. A funeral service will be 11:00am Tuesday at the chapel with burial in Johnson County Memorial Gardens. Memorial contributions may be made to Kansas City Hospice and Palliative Care, 1500 Meadow Lane Pkwy, Suite 200, Kansas City, MO 64114. Kenneth was born Nov. 5, 1922 in Adrian, Mo to A.W. and Fannie Monroe. Kenneth served in the U.S. Army during WW II Company I, 112th Infantry, 28th Regiment. He was awarded numerous medals including the Bronze Star, Purple Heart and the European Theatre Ribbon with 3 Campaign Stars. He was captured and held as a POW in Germany for almost 6 months. Kenneth retired as a Supervisor with the U.S. Postal service in 1979 after 33 years of service. He leaves behind his wife of almost 70 years, Genevieve Nadine. In addition he is survived by daughter, Diane (Bob) Eisele, Olathe; son, Leslie (Candy) Monroe, Shawnee; daughter, Lisa (Mark) Glover, Emporia. He also leaves behind 8 grandchildren and 7 great grandchildren.